Is it possible to lock file in Dropzone? Aptonic Software Forums → Dropzone Support → Is it possible to lock file in Dropzone? Topic: Is it possible to lock file in Dropzone? I got a file that I need to use for many times. However, it disappear everytime I drag it out. Is it possible to lock file in Dropzone? Re: Is it possible to lock file in Dropzone? No but this feature is urgently needed and will be in an upcoming update. I've added this ability in Dropzone 3.5.5. 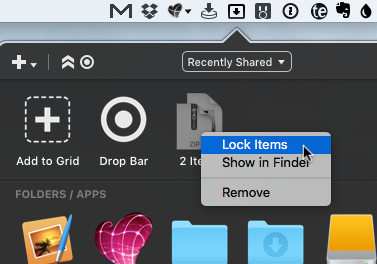 You can now right click on items in Drop Bar and click 'Lock Items' - a padlock will then be overlaid to show you the items are locked and the reference to the files will remain in Drop Bar until you remove them or unlock them and drag them out.